Image is pleased to reveal a variant cover featuring art by Marc Silvestri, inked by Todd McFarlane and colored by series colorist Owen Gieni for issue #7 of Chris Dingess and Matthew Roberts’ critically-acclaimed Skybound series MANIFEST DESTINY. 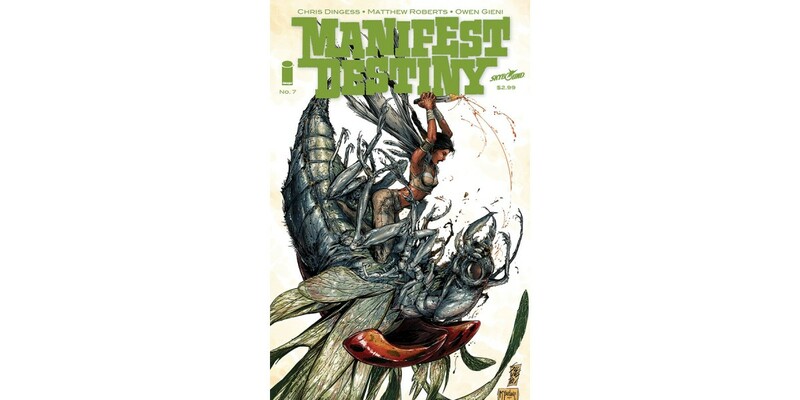 MANIFEST DESTINY #7 will be available on 6/11 for $2.99 and you can order it now with Diamond Code: APR140575. The Silvestri/McFarlane variant cover can be pre-ordered with Diamond Code MAR148175. Final orders are due from retailers on 5/19. For those still catching up on the adventure, the second printing of MANIFEST DESTINY #6 is available to order with Diamond Code MAR148147 and will be released on 5/14. MANIFEST DESTINY, VOL. 1 is available to order for $9.99 with Diamond Code MAR140546 and will hit stores on 5/14.